I came from a 2015 BMW 328i M-sport with a manual transmission, and I had two other 3 series cars (2003, 2014) prior. I developed some severe back issues that required moving to an SUV to ease getting in and out of the car, and reduce pressure on the low back. I had been using Lyft to get around because the clutch, low seating position, and uncomfortable seats in general, were aggravating the back pain. I saw the RDX online and the seats looked cool. I test drove it and I liked it. I know myself and I'm prone to OCD so I decided not to test drive anything else. I compromised on price paying more even though I knew I could do better just to get the car sooner and from the closest dealer, and here I am. Overall, I'm as satisfied as I can be moving to an automatic transmission SUV. I used to think less of folks that owned SUVs, but now I'm able to appreciate the comfort since I have low back issues. It's nowhere as pleasurable at the 328i in terms of engine/transmission, or being stable in curves, but it is way better in terms of seat comfort and the suspension comfort. A HUGE plus with the RDX is that it draws zero attention. I did not like the kind of attention the BMW got from other drivers and friends/neighbors. Ironically, the cost of both was nearly identical because the 328i was optioned very lightly. My insurance dropped by 20% moving to the RDX. Last edited by anoop; 10-24-2018 at 09:47 PM. It was outmoded and time for a modern car. The 540 set up with all the modern driving aids as I would want it was close to $70K. I feel I gave up a little when I went with the RDX tech but saved ~$25K. I buy my cars and tend to keep them for 8-9 years. The bimmer made it to 11. Last edited by Madd Dog; 10-25-2018 at 06:10 AM. I almost bought one, always wanted a Subi. They dont make the turbo engine anymore. 1998 Outback. Best foul weather car I ever owned, worst build quality car I ever owned. 2011 Audi S4 MT, I have only owned manual transmission sports cars since college, this is my first automatic, and SUV, love the tech and looks, but obviously does not drive like the Audi. Needed more space for kids, gear, etc when biking / camping. BMW 428i gran coupe. Had been with Acura 3 previous cars before BMW. Needed to have more space and higher up for convenience Acura RDX Advance was best choice and I missed the reliability of Acura. Very happy driver. I had leased the audi and it is ending at the right time. Needed more space, less maintenance costs and some of the latest tech like auto high beams, backup camera, blind spot monitor. Plus my wife likes suv's more than sedans. My rdx is still in transit. I know it won't drive like a small sedan but based on my test drives, it was closest to the fun I had with a3. I loved the a3 and it is difficult to part ways but with multiple problems and high costs it's became a pain. Both front brake rotors and pads had to be replaced at 25000 miles as they were warped, started feeling vibrations above 60 mph within 3 years which could not be fixed by 2 audi dealers. They finally said the magic words that they could not feel it and what I feel is usual road feel.  Anyways I had enough fun with the vehicle and it is time to return so did not bother much. This is probably going to be a bit of an outlier: 2012 Ford Focus. I'd been making some sacrifices in recent years while servicing an onerous mortgage, and figured I deserved a substantial upgrade after selling my way out from under that. Hello...so, in a word, YES. Very happy, in fact. I really can't think of anything I liked better on the 2017 (as good as the experience I had with it was), TBH. The scaling issue in the nav might possibly be in that category, but I'm finding that between the voice and textual cues of upcoming turns and the HUD sort of saves the day for me -- not to mention the great thing of having the native (Acura), Apple Maps, Google Maps, and Waze options to choose from. But scaling can be crucial for some so I hope we will get an update to include it. I totally agree about sticking with the same color...lol. I mean, Fathom Blue Pearl. There are other nice colors but LOVE FBP! Good luck with your decision-making. You won't lose if you choose a Q3. Also a very, very nice car. Yeah, the old ones are like really, really bad Chevy build quality. But they really have turned them around. 2006 Dodge Ram 1500. I purchased a new F150 2 years ago to replace the Dodge, but ended up with a long commute and didn't want to pile miles on a brand new expensive truck. Drive the Dodge till 142,000 miles while researching and saving for a more proper daily driver. 2004 Toyota Highlander (original owner). Was going to get the 2018 Subaru Forester XT, but really like the RDX A-Spec's look and better material. Replaced our 2018 San Marino Red TLX A-spec V6 SH-AWD Elite with a 2019 Modern Steel Metallic RDX A-spec. I like the more premium interior finishing, but wish it had the HUD and heated rear seats. thanks! It's more difficult deciding in a baby seat and stroller vs picking a new car. Replaced a 2016 ILX /Tech with the 2019 RDX /Tech. SUCH an upgrade. The RDX replaced a 2017 MB GLC300. Last 4 leases were Mercedes, needed a change. Having had the MDX, a TLX and a TL (loved this one), I knew I would be good with Acura. 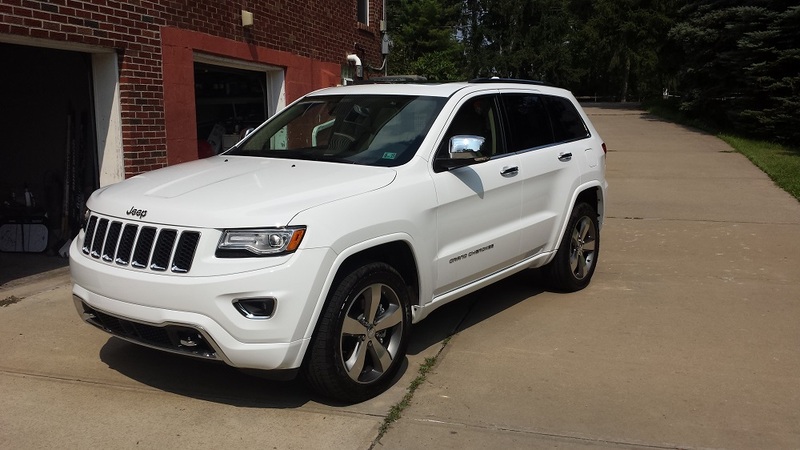 Replaced a 2014 Jeep Grand Cherokee Overland EcoDiesel. Owned for 4 years, 90,000 miles. Few things the Acura has better - sounds dumb, but it's nice to find your car in a sea of white Jeeps GC's scattered over the parking lot, seats are more comfortable over long trips (had many high class cars in my life, don't think anything beats Acura's comfort), love the split screen - had this in my BMW too, Apple Car Play seems to be a wife favorite, now that it has Waze...game changer IMO, like the walk away lock feature (had this on my Mazdaspeed 6), better acceleration, better looks. Not missing the diesel prices, or needing to find specific stations that actually sell it. Wife had 3 CR-Vs, leases. Really liked the upgraded materials and engine/trans of the new RDX and the test drive sealed the deal. I drive a G2 Honda Ridgeline and have never had a better pair of vehicles in our garage. The new RDX( purchased) got us back in an Acura after a 10 year absence but loved our original MDX and the 4 TLs we had. It was great having the Acura dealer buying experience again. So much better than even Honda dealers. 2008 BMW 528i---proved to be a terrible snow car in the Sierras...go figure. Had a 2016 TLX SH-AWD and felt the need for a hatchback and higher seating position. Tested and liked a Mazda CX-5 Grand Touring but, needed to see if the RDX was worth an extra 10K. Replaced a very tired 2003 Cadillac STS seville. Driving is a joy again! I replaced a 2014 BMW X3. I came from a 2018 Subaru Outback that couldn't get out of its own way. I made a big mistake buying it and letting myself get caught up in the Subaru safety, utility, reliability hoopla. I have only had the RDX for a few days but it is clearly a dynamically superior vehicle. 2014 RDX technology. I always have at least one Honda/Acura as I drive 25K-30K a year on my daily drivers. I have always had at least 1 Honda or Acura in the driveway since 1981. 2005 Acura TL. It was a good car, which in 2016 still had better headlights and much better audio system than small Mercedes-BenzGLA 250 we purchased in 2016. 2007 RDX Tech. It was pretty much trouble free but it's a gas guzzler. Also wanted something more modern. Been a lifelong Honda/Acura fanboy but has been disappointed with Acura models for the past decade or so.When they showed the 2019 Acura RDX I knew Acura finally woke up and I gotta have one lol. I combined a 2017 Ridgeline and 2018 Accord into a 2019 RDX because I rarely need a truck and wanted my garage space back and a lower insurance bill. Weeks later, my father passed away leaving me with a second vehicle and requiring me to rely on my brother to help me clean out his house. Sorry for your loss. It is a hard thing to lose a parent. Hopefully, at least he had a good run, and did not pass untimely. My 2019 RDX SH-AWD Advance replaced my beloved 2003 TL Type S, which I bought new in 2002. I gave the TL to my son.